You are trying to wrap up your last blog post, or even trying to beat that last level in that game you are addicted and all of a sudden your computer gets a blue screen (BSOD) and shuts itself down. Or you could even just be browsing the internet from your bed or couch and you accidentally slide your laptop over your legs and it almost burns you! These things can happen pretty easily, but they can also be prevented with a little bit of simple maintenance on your PC or laptop that will only take you 10-15 minutes about two times a year. 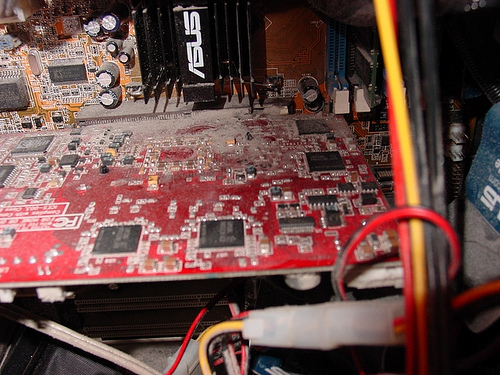 The maintenance that I’m speaking of is pretty simple: cleaning the dust out of your PC or laptop. I remember when we finally opened up our 6-7 year old Dell and you couldn’t even distinguish where the motherboard was. Literally everything was caked in dust and it was amazing that the thing had even lasted that long! Fast forward towards my graduation and getting my first job and one of the first things I saved up for was building a PC. I also ended building a new computer for my parents as well, so I didn’t plan on letting these computers get that way. I want them to last well into the future and be able to to upgrade them without buying an entirely new PC. The solution? Making sure to dust both PCs out about twice a year, especially right before Summer when they would most likely be running at their hottest temperature and need all the help they can get. Most people would think to just run and get a can of compressed air, right? Well I found a solution that I think works better and will definitely save you money in the long run. It has also helped to motivate me to do this really simple task more often without having run out and get compressed air. The solution that I’m talking about instead of compressed air is the Metro DataVac which will cost you around $55-60 but pay for itself after about 5 or 6 cans of compressed air. You won’t have to worry about static discharge from a regular vacuum and you wont have to worry about the liquid coming out of your can of compressed air if you happen to hold it at the wrong angle or you can runs low. This does have a pretty big motor in it, so the vacuum does get very hot which is the only drawback of it. That’s after about 5-10 minutes of usage though and for the purpose of cleaning a computer or laptop you probably wont need to go past that time limit. But I would give the vacuum a break if you plan to use it for more than that length of time. When it comes to actually cleaning your PC or laptop, the most important part is to make sure your computer is completely unplugged before you do anything. You should also take the battery out of your laptop before doing this as well. It’s a good idea to do this outside on a table if possible – will save you the effort of having to clean up the dust afterwards. Try not to do this in a carpeted area to reduce the chance of static discharge and you really wont have to touch any of the actual components in your computer. You can always ground yourself by touching something metal as an extra precaution. Another thing that I want to stress is that you should always hold the fans in place before blowing any air on them. If they spin faster than they are designed to you could strip the bearings and your fan wont work. You can just stick a pen in between to stop the fan from rotating or even using tie wraps works pretty well. Most desktop PC towers you will only have to take off one side of your computer. There will be two thumbscrews or or regular screws holding the side panel in place and you should be able to just remove them and slide or lift the panel right off. You can then go ahead and clean out all the dust until the inside looks spotless! For specific brands I would recommend Google-ing (or Bing-ing) open Dell, HP, Lenovo, etc case. There will be plenty of tutorials and videos on Youtube for your specific brand or model. Laptops can end up being a little more complicated as they normally have only one exhaust fan that can easily collect dust and cause your laptop to get really hot. You will most likely have some plastic tabs on your keyboard to remove it, or maybe even screws. There might also be one or two screws either on the bottom or top of your laptop that will also need to be taken off to access your fan. It shouldn’t be too complicated but will be a little trickier than a normal desktop PC. Once again searching the internet for your specific laptop model or similar models will be your friend here. If your fan is completely blocked or clogged, it might be better to just try grabbing the clump of dust and hair yourself before even using compressed air or the Datavac. After you do it the first time you will realize just how simple it is! 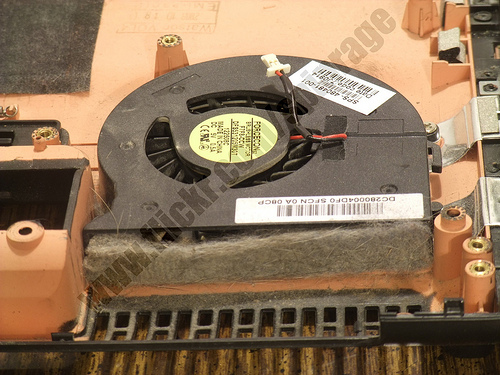 This is exactly what you don’t want your laptops exhaust fan to end up looking like! This is an interesting find; I never knew little handheld vacuums like this existed. Compressed air can be rather expensive, so this might be a good alternative, especially if you have more than one computer/laptop in the house. Your picture is sadly nothing compared to what the inside of my tower has looked like. We had 3 pets at one point and their hair always found a way to accumulate in the tower. It was awful. Needless to say, cleaning it out seemed to solve a lot of problems the computer was having. I didn’t know about these until last year either when I was researching computer parts. The good thing is you don’t have to worry about static discharge like you would with using a regular vacuum as well. I wish we had taken pictures of our old Dell tower, that thing was pretty bad! Don’t have to deal with pet hair though I would imagine that would make things much worse – especially for laptop fans. 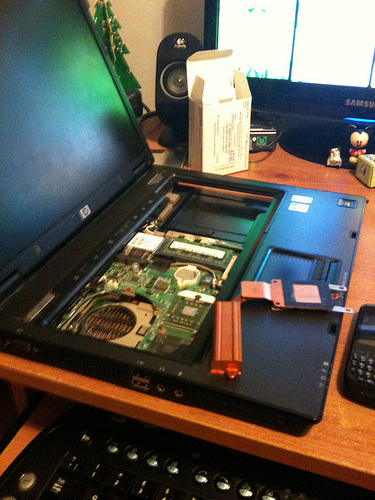 Every overheating problem I had with my laptop was always solved by cleaning it out. Not having to buy the compressed air makes it easier to clean everything regularly now, and it has probably paid for itself in the year I’ve had it. It also comes with a one year parts warranty and a five year motor warranty, but I’m hoping it lasts even longer than that!